I always thought it was a tattoo, kind of weird looking, 3D almost so I decided to google it and man it looks weird as hell. He's got another one on his right arm I think, like a horseshoe or something. It is a horse shoe. He got them in college, in horse riding/jumping competitions. Every time he won, they embedded a small horse shoe into his arm. You see them all over down here near Dallas. What's the process though? What happened to his skin? And isn't there a risk of it tearing with the shoulder pads and everything going on there? Yeah it's branding from his fraternity Omega Psi Phi. I work with a guy that has similar marks. 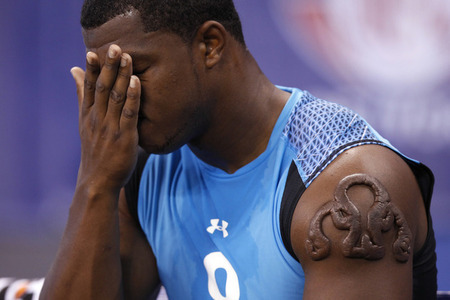 He just really, really wanted to play for the Colts. It's a fraternity thing as Penguin said; hopefully this thread dies before the judgment begins. Seriously, this is the first time you've ever noticed it? There was much discussion about this when he was drafted. Including the pad/tearing issue. Last edited by Vinny Testaverde's Niece; 09-20-2014 at 01:35 PM. Willie Colon has one, too. It's a frat brand. Seems somewhat common. Crazy how you never noticed this until now. It's a brand from his fraternity...Omega Psi Phi. His skin formed a keloid after getting the brand, that's why it looks a little unsightly. yeah you can tell him :-)....because if we know anything it's that not only is he a big ba$tard but also that he's impervious to pain and suffering. I could give two chits what he is impervious to, I want to see him inflict it. It's a frat brand, and it look absolutely retarded. He's an idiot. Imagine how disgusting that sh*ts going to look 30+ years down the road. Lol @ the replies here. It's a brand. They've been around for thousands of years. It's funny that people are aghast about what he did to his arm...considering what we watch him do to his whole body every Sunday from September to December...and hopefully January and the first week of February. man, frats are so cool. Joint pain and back pain don't make you look like a deformed idiot, though.